I am definitely a meat and potatoes kind of girl, I also like making dinner that simple and easy since I don’t have a ton of time to cook everyday. 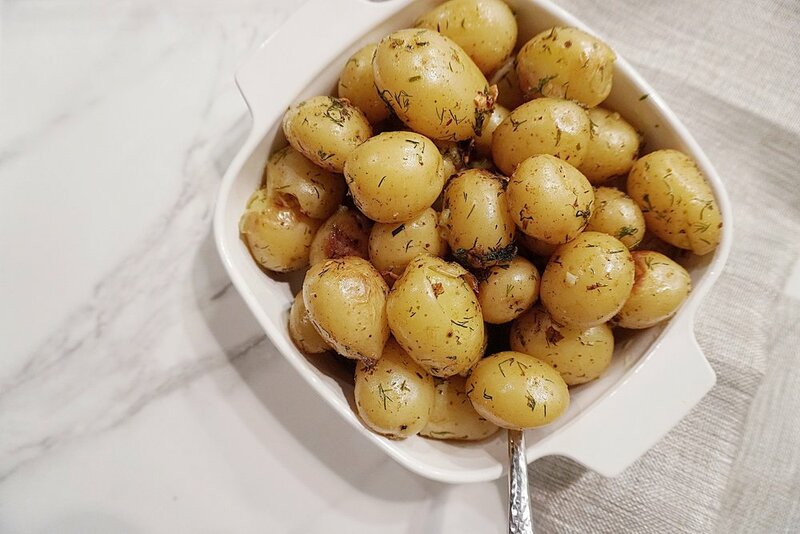 These Pan Roasted Garlic and Dill Potatoes are so delicious and takes barely any prep time at all! These are a great option for if you meal prep, just cook a lot in advance and you’ll be set for your week. 2. Place potatoes in medium or large pan, cover potatoes with water and cook on high heat for 10minutes and then remove lid and add half of your butter. 3. Let the potatoes continue to cook until water is close to evaporated. You should have a pasty butter mix left. 4. Chop your dill and mince your garlic. Add these with your remaining butter and a dash of salt and pepper. 5. Let cook a few minutes of each side and viola! Easy peasy delicious side dish complete!